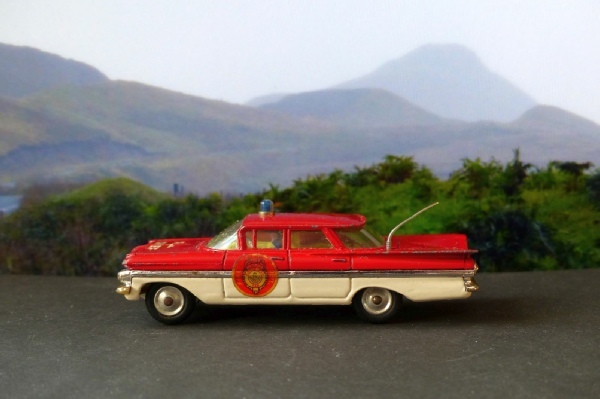 The second version of the Impala Fire Chief car, with the chrome running through the middle of the car. This was not around for long and few available in good condition. This is original and in reasonable condition all round. The sides are bright, as are the wheels. The stickers in place but some letters are missing on the bonnet. There also seems to be some pin prick corrosion on the top panels but, as the photos show, it looks very smart still. The lamp is blue and still there in a metal base and the aerial is original - now that is quite unusual! This example has now been sold. Look out for another coming soon.